In 1982, I traveled to Pakistan as part of a group of Sufis under the instruction of Shaykh Fadhlalla Haeri. The purpose of our mission was to set up a teaching center, free clinic and women’s center in a rural and under serviced area of the Punjab. Each one of us was to serve in various capacities, each finding their own way to be useful to others. Shaykh Fadhlalla saw this mission two fold. Firstly it provided an arena for westerners to live among people that were not over exposed and spoiled by the commercialism and excessive living in the west. These were people who lived simple God fearing lives, with less of the trappings of the western world. With less emphasis on the outer, inner qualities were more cherished and simple real relationships were developed easier. Our stay among these people affected us greatly. We were often pushed to the limits. We experienced how dependent and spoiled we were, on the way of life we had in the west. For the first few weeks it was more or less easy. But when the novelty wore off it was like we had come down with withdrawal symptoms, and had checked into a country sized rehab clinic being addicted to some powerful drug. It was accepting and coming to terms with our inner and outer condition that made our stay in Pakistan one of the most transformative times in our lives. We came away with a “real” appreciation for what Allah had given us. We learned a great deal about our personal limitations and the extent of our sincerity for the path we were on. Secondly, our stay among born Muslims was an inspiration and benefit to them as well. Wherever we met Muslims in Pakistan we were met with love and welcoming. As soon as they discovered we were new to Islam, there would be an instant love and appreciation for us. We were often taken in to people’s homes like their own children, brothers or sisters. This was the most beautiful part of our stay. Our presence amongst them brought about a reassessment of their own practice of Islam. It is all too often that born Muslims take for granted the great gift of Islam they had been given. This is the great blessing that Islam has for its sincere followers. As new converts enter the fold, the whole is benefited with the freshness and added vitality. This is the way it was at the beginning and the legacy of that model remains as vital today as it was then. In western society we are veiled from witnessing many human situations and states of being that inhibit the development of the heart. The heart being the container of the divine light. Poverty, sickness, old age and death are secured away and compartmentalized in our western societies, taking them out of our daily experience. This tends to make us forget the suffering of others; it hardens the heart and prevents us from reflecting on our own vulnerability and certain end. As humans we need to see these aspects of life. It is what creates the need to seek out answers in regard to our nature. It promotes in us asking questions about the inevitability of our end. It makes urgent the desire to know what this life’s experience is really all for. It can’t be just to consume tons of food and drinks, thousands of meetings with people for what purpose? To have more material goods? More this more that, and then death? I was awakened that first morning with the calling of the dawn prayer. I could hear the melodious chant, echo throughout the sky, as one mosque after another added its voice to this beautiful ever-growing symphony. “God is Great, come to the prayer, come to success, come to the best action of all”. Tears rolled down my cheeks as the call to prayer filled my heart with its meaning light. I now knew that I had arrived. As the sun generously rose and the curtain of night was lifted from the stage of the first day of our journey, I was suddenly struck with both excitement and apprehension, about the prospect of venturing out of my room and into the streets of our new life. I could hear the clatter of hoofs, and bells, voices and smells, all blending together beckoning me to see first hand how it all fit together. Building my resolve, I walked out the door and met with the new world around me. In front of our house was a poorly tarred road, on which a parade of horse drawn carriages, motor bikes, bicycles and motorized kama Qazi rickshaws, racing up and down. They were like over sized bumble bees, buzzing along in a competition of who could produce the most noise, smell and visual pollution. I would have given them all, the first prize! Across the road was a “chai khana” or tea house, where they sold hot tea, sweets and Pepsi Cola. The bottles of which were all scripted in Urdu. I managed to order a Pepsi and slowly sipped it in pace with my new surroundings. I was bemused and enchanted with it all. Although I had never experienced anything like this before, there was a sense of familiarity in it all. It slowly drew out of me a sense of ease, belonging, and recognition of the universality of man. As I stood up from my chair, I arose with a new sense in myself. I was no longer in my own eyes a foreigner, but a brother who comes home to discover and be discovered by others as a kindred spirit. It is amazing how as human beings we are not so different from each other. The basic elements are there in each one of us. It is only expressed and developed differently depending upon our upbringing and overall outer circumstance. We had met Dr. Khalid Iqbal in College Station, Texas, in the USA, where he was working as a research assistant on the “star wars” defense project. We had our center of activity in Texas near San Antonio. As part of our projects we would often go out to different colleges and universities, looking to share our path with others. From time to time someone would embrace Islam, or a born Muslim would met us and soon after reassess their lives, changing themselves to a more spiritual direction. This was the case with Dr. Khalid Iqbal. He made a 180-degree turn in his life; he would leave his work at the university, and return to serve his community that he had left behind in Pakistan. It was with his invitation and support that we were able to carry out our projects in Pakistan. Dr. Khalid’s house became our home for sometime, before we had our own center. We were immediately made to feel at home and were brought into the family in every way. Once we got our center, others from the America and Europe joined us. We now had regular teaching and a circle of Dhikr was growing. Pakistan is a synthesis of feudal landowners and tribal chiefs. Before statehood, these ancient domains administered both India and Pakistan. The British colonization of the sub-continent was done by their application of their strategy of “divide and conquer”. Summer nights in Dera Nawab Sahib were not much different than the days. They were hot and uncomfortable. It was so hot this particular summer that our bed pillow covers felt as though they had just been steam ironed. I used to wet the sheet of my bed and wrap myself up in them. But it was a short-lived comfort. The sheets would dry within a few minutes. On one of these summer nights we came to hear about a Sufi Shaykh, visiting our village by the name of Shaykh Sayyid Ikram Hussein. We were invited by one of the Shaykh’s local Mureeds for a meeting. We came to the house where the Shaykh was having a Majlis. It was in a large open room with plenty of cushions along the walls. After removing our shoes and greeting everyone upon entering, the Shaykh stood up and kindly invited us in with loving and welcoming gestures. After just a few moments he ordered everyone out, with the exception of our party. Soon everyone left, and the Shaykh ordered the curtains drawn and the doors locked. This was all very irregular and concern and confusion were clearly recognizable in the faces of those mureeds who were leaving the room. Once it was only us, the Shaykh began to question us about what we were doing in Pakistan, the name of our Shaykh and individual questions about our stay in Pakistan. During the course of our meeting the Shaykh leaned over and reclined on some pillows under his arms, with his legs stretched out. We thought nothing of this but soon there was the rumbling of discontent outside the door. Suddenly there was a breaking sound, and the door came swinging open followed by several of the people outside. They were visibly very upset; one had a machete in his hand. There was a flurry of shouting and gesturing. The Shaykh laughed a bit and then scolded them, asking them to leave until they were asked to return. We found out through our interpreter that the Shaykh’s mureed’s were so upset due to the fact that they saw Shaykh Sayyid Ikram reclining. That the Shaykh would never recline in front of his mureed’s. They thought that we had maybe poisoned or cast some spell on the Shaykh. The Shaykh’s response to them and to us was that it was true, he never reclines with this mureeds, but he added that was not the case with his family. At one point he went around the room asking us all the same question. What have you learned and benefited from the Sufi path? Each one had an answer, some were very cleaver. The Shaykh was not impressed with anyone’s answer until it was the turn of a young man named Ali Abdul Aziz. His answer was that he was new on the path and was unable to answer at this time. 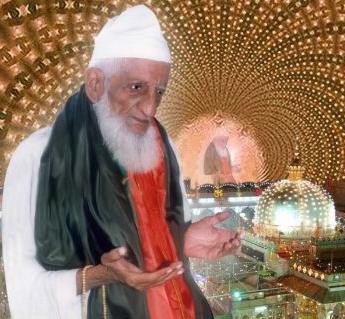 The Shaykh said that he was the real Sufi amongst us. After much tea, talk and pan chewing the meeting was over. We left the Shaykh with a sense of having reunited with a long lost friend. This was to be the beginning of many meetings, gatherings and personal experiences with the Shaykh. While living in the capitol city of Karachi, my wife had come down with a serious ailment that was life threatening. Shaykh Ikram visited us in Karachi regularly and being accomplished in the art of healing, he prescribed a combination of Berberus, lemon and six grams of opium to be made into a paste, rolled into balls the size of chickpeas and taken over a period of several days. He assured us that this would cure the situation immediately. I was stunned that he suggested opium, as it is not only illegal in Pakistan, but that if a foreigner like myself were to be caught with it, I would be locked away in jail with little help from anywhere to get out. I expressed my concerns to the Shaykh about the opium and he responded with a little giggle and assured me that I would be fine. With that he suggested a few places for me to begin my search and left our home saying he would return in a few days to check on his patient. That afternoon I ventured out into the market places and bazaars that foreigners are rarely seen. These were the bazaars in and around the waterfront area at the Karachi port. There were things there for sales that were not for the regular consumption. Things like condoms, old girly magazines, love potions and all kinds of occult crafts and spells. There were also many herb shops and local healers had their offices there. I began asking for opium at the herbs shops, but was met with anger and warning that I would be arrested or beaten. Some shop owners chased me with sticks and others pushed me out of their shops. It had been several hours and I had not had any clue or direction where to turn to next. I wondered farther into the bazaar and came to a clearing where there were many flower shops and sweets. In the middle of the bazaar was a man moving through the open area of the market, walking on his hands. His legs were knurled and crossed over each other. Every inch of his body was covered with sacks of skin like so many Christmas ornaments hanging on a tree. There were hundreds, from very small sacks to ones the size of a gold ball. He could hardly see as they dangled from his forehead over his eyes. He was begging for food and money. I was taken deeply by this sight. I reached in my pocket and took all the money I had with me. The money I brought to buy the opium, and gave it to him. When I placed it in his hand, he prayed for me. We greeted each other and soon parted. I was now without money and my patience for this search had run out. I started to make my way out of the bazaar. As I followed the route I had come, I suddenly became disoriented as to what direction to go. There were so many twists and turns, ally ways and streets all looking the same. As I stood there deciding which way to go, I suddenly felt a tugging on my sleeve. I looked down expecting to see a child begging or something like that. What I saw was a man sitting on a clean white sheet, wearing the most impeccable clean and white clothes. At first I treated him like a beggar. I said “mafkarow” which means “forgive me”. He responded in English “No, please forgive me. May I have a word with you please?” He beckoned me to sit down on the sheet with him, which I did. He then asked me what I was doing in this place. I explained to him more or less what I was doing there. I left out the part about the opium, as I was still suspicious of the intention of this man. He then told me what he was doing there and why he tugged on my sleeve to join him. He said that the night before he had a dream that his now dead Shaykh had come to him, instructing him to come to this bazaar and sit on a white sheet, and wait for an unusual man to appear. He said you are the unusual man. He then asked what he could do for me. At this moment, I knew that there were other forces at play. That all that has happened was part of a plot yet to unfold and become known. I humbly told him about my wife and the prescription of the Shaykh for her ailment. As I spoke, I would see his eyes swell with tears. He reached for my hand, and consoled me that Allah and his awliya were looking after us. He produced form behind him a black leather bag, the kind a doctor would have. He reached in and pulled out several small bags of herbs and mixtures, along with a small brass scale. In one of the bags was a black tarry looking substance. It was opium. He removed it from the bag and weighed the opium; it was exactly six grams as Shaykh Ikram prescribed. The man gave me the bag and said that this was the reason he had been instructed to come here today. He lifted his hands on prayer and we both stood us together. I was now considering how I was going to pay him, after I had already given away all my money. Before I could inquire, he grabbed my hand and said that the opium was a gift to me and my wife and that having fulfilled the instructions of his Shaykh was enough payment for him. With that he asked to be excused. I suddenly heard my name being called form somewhere out in the bazaar. I turned and looked to the direction the voice was coming. I saw nothing. By the time I turned back to face this man, he was gone. Not a trace of him, his sheet or marks on the ground. He had just vanished. I did not even get his name. I returned to my house and mixed the mixture as prescribed by Shaykh Ikram. I gave the homemade pills to my wife and within a few hours the symptoms subsided and after a few days she was well again. The exception being that the opium had made her a bit intoxicated. She complained how she felt like she was floating. I thought that this was what she would have to go through, being the effects of the opium. After a few days Shaykh Ikram came to visit as promised. He tended to my wife. He came to and asked to see the pills I had made. I will never forget the look and smile on his face when I showed him the pills. He just smiled and said “too big”. He took a knife and cut each one into four. We all had a good laugh that day. One day Dr. Khalid had come to Karachi to visit us, and to see his relatives. He had a cousin called Rasheed who owned a new restaurant at Clifton. Rasheed requested Dr. Khalid that he be taken to visit Shaykh Ikram at his home in Hyderabad, which was about a five-hour drive from Karachi. I was asked to accompany them. I had never been to Shaykh Ikram’s house. I considered it an honor that we were allowed to visit him. Shaykh Ikram refused to allow anyone of his students to come to his home. He lived in a very humble home made of mud brick. He liked it that way. He knew that if his students came, they would want to move him out to a better and bigger place. We arrived at Shaykh Ikram’s house in the early afternoon. He generously welcomed us into the courtyard of his house. We were soon served tea and some simple sweets. As the tea was being served, the Shaykh asked Rasheed to hold out his hand with his palm up. Rasheed complied with the Shaykh’s request. The Shaykh then reached behind him and brought out a stack of small denomination of rupee notes. He then started placing the money one note at a time in Rasheed’s hand, counting each note. He went on and on until Rasheed’s hand was overflowing rupees. Rasheed became more and more agitated as the Shaykh continued on. Finally Rasheed, politely requested the Shaykh to stop that it was enough. Shaykh Ikram answered back saying: “but isn’t this what you came here for”. You could see the shock in Rasheed’s face as the Shaykh revealed the real intention for the visit. Rasheed feeling exposed and cornered replied in the affirmative. He had come; not for a spiritual reason, but to ask the Shaykh to pray for his new business and that it would be a success. The Shaykh said that he was not against this request, only that he wanted Rasheed to be open and honest about his intentions. The Shaykh agreed to pray for him with the following conditions. That Rasheed keep to his prayers and that he not rush after money. That he must take care and not to run after his dunya. He warned Rasheed that running after money would lead to disaster. Rasheed accepted the Shaykh’s consul and promised to heed his warning and injunctions. Several months passed after this visit, when one afternoon I received a phone call from a mutual friend of Rasheed’s, it was news that Rasheed’s daughter had been shot and killed. I rushed over to Rasheed’s house and found his entire family whaling in the parlor. Rasheed appeared from the upper lever of the house. He rushed over to me, in tears. I inquired to what happened. I was told that Rasheed was upstairs cleaning a rifle he uses for target practice. There was a phone call from his business that something had happened to the receipts from the night before. There was money missing and Rasheed had to come down to his business immediately and take care of it. Rasheed rushed out the door in a panic, leaving the rifle in his bed, loaded. His small son and daughter entered the room and seeing the rifle, started to play cowboys and Indians. His little son aimed the rifle at his sister and pulled the trigger, killing her instantly. When Shaykh Ikram was told of these events he was so upset that he refused to visit Karachi for three months. He called it the belly of Satan. Life is full of lessons. Some come to us like a fragrant breeze, others like being hit by a train. There is not doubt that if one is sincere to God and to themselves, then the lessons of life will come in a way like the breeze. But when one is thick and without fear of consequences, then the lessons are knocking louder at the door. There is a Sufi tradition of commemorating the passing on of an enlightened Shaykh or Wali u`llah. (Friend of God). In the sub-continent it is referred to as an Urs. These celebrations often go on for days and act as a focal point for adherents of the Shaykh to gather from all over the world, meeting each other and communing in their dedication to their path. There is usually lots of Qawali singing, plenty of food and tea going around the clock. During the celebrations a living Shaykh sits at the head of the gathering while the singing and celebrations are going on. As the singing and momentum of the gathering grows, many of the attendants enter into states of varying degrees of intoxication. They often get up and dance around, some collapse in exhaustion and others in spiritual ecstasy. We were invited to one of these gathering by Shaykh Ikram, who is the head and living spiritual inheritor of the Shaykh, whose Urs we were attending. As we approached the environs where the gathering was taking place, I could feel the radiation of light coming from all direction. This feeling grew stronger as we approached closer and closer. Upon arrival we were immediately whisked away to a room that had been prepared for us near the main field where the gathering was taking place. The room was filled with the sweet smell of incense and rose water had been sprayed on the walls and floor. There were several beds waiting for us to have a rest on. Each was clothed in satin covers, and they were covered in thousands of multi-colored rose petals. Several young men who brought us rose and almond flavored milk, followed by tea and sweets, attended us to. It was so sweet. We were humbled by the way we were treated. After some time we were invited to the Majlis where Shaykh Ikram was holding audience for those who wanted to seek his advice and blessings. When I saw Shaykh Ikram this time, I noticed a radical difference in his state. He appeared to my perception larger, and his face glowing with light. He gestured that I sit near him. There was much conversation between the pan chewing and cigarettes. The attention was dispersed throughout the room, with little focus on anyone in particular. I felt more like an observer and remained mostly silent throughout. Then Shaykh Ikram turned to me and asked that Dr. Xaigum translate from Urdu to English. The Shaykh started to direct his conversation directly to me. His topic was sincerity, and its virtues. He went from speaking about it in general terms to speaking directing to me and addressing my own personal sincerity for the path. I felt very uncomfortable at first having the diagnosis’ of my illness laid bare to everyone present, but soon I accepted. I closed my eyes and with a clear resolve opened my heart and mind to the words of the Shaykh. I imagined his words to be like healing rain, washing away the dust and dirt that had accumulated there over time. I sat with inner stillness hanging on to each meaning and savoring the passing moments. The Shaykh seemed to go on for some time, when started to hear other people in the room crying and others reciting praise to Allah under their breath. I was not aware of what was affecting them so profoundly. I considered that it might be what the Shaykh was saying to me, they had applied to themselves. I continued to listen to the Shaykh’s words, when I became acutely aware that I have been listening to the Shaykh’s instructions to me, as though he were talking in English, directly into my heart. I listened to hear the voice of the translator, but there was none. It was the Shaykh speaking directly to me, and I understood every word. I could hardly contain myself. I opened my eyes, and saw the faces of those around me all in recognition of what I had finally come to realize. I looked for the translator; he had gone some time ago. I was so overwhelmed that I leaped across to where the Shaykh was sitting and collapsed in his lap in tears. He began to stroke my head and laughed and recited the Ayah of Qur`an that says: “Allah is closer to you than your jugular vein”. From that moment on my state had changed. I was given a taste and glimpse of an inner quality that was gifted to me by the baraka of the Urs, and the kindness of Shaykh Ikram. The entire evening that followed, the singing the dancing, all the hugs and tears, were all dyed with the flavor of this experience. In the early morning hours the festivities drew to a close and we all retired to the beds in our room. Shaykh Ikram insisted that he sleep in the same room with us. He requested that we all remember our dreams that night. He said that we would all have inspired dreams that night. I reflected what he said with my experience of this day, that we are already living in a dream. We believe the parameters of our sensual experience to be the bounds of perception. How foolish this assumption is. Our senses are but limited organs of experience exposing only a small degree of what is possible for the human heart to perceive. There are greater inner senses whose scope spans wide into the more subtle worlds. We are blind and asleep until there is an awakening to the inner light. That light’s source is from the infinite reality, boundless and forever giving. If we are fortunate to catch a glimpse of it, and combine it with our want to its source, we have certainly fulfilled our potential, and true joy will be ours.